US, 2016, 97 minutes, Colour. Voices of: Jason Sudeikis, Peter Dinklage, Bill Hader, Keegan- Michael Key, Maya Rudolph, Danny Mc Bride, Josh Gad, Sean Penn, Ike Barinholz, Gillian Bell, Tony Hale. Directed by Clay Kaytes and Fergall Reilly. Is it an advantage to know beforehand that this animation film is based on video game? For older reviewers this comes as something of a surprise, not part of their area of expertise. for younger audiences, they probably take it for granted and have been looking forward to a full-length feature film of the game. 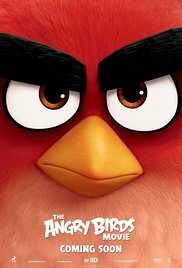 It has been said that the production company, Rovio, invested completely in the film and part of their future will depend on the success of Angry Birds – but, on its first weekend in US release, it took $40 million. So, Rovio will still be in business for a sequel!.Its stance amusingly enough with Red, the central avian character, falling while trying to juggle an egg, and exploit that rivals exes mishaps in the Ice Age Films. His destination is, dressed as a clown, a birthday party whether father up breeds him for being so late, not listening to any excuses – and we know whether birthday cake is going to finish up, right on the face of the angry father. Clearly, Red has anger management issues. Red is ordered to go to classes, teaming up with a spiky little bird, Charlie, and a huge amiable lump of the bird, Bomb. Classes and exercises are not the most helpful. But, as liberties of the game will know, this is not just a story about birds. It is a story about pigs. And the pigs are the villains. They settled into the birds’town, claiming to be friendly, organising festivities for the unsuspecting birds while actually planning to steal all their eggs so that they can begin to a feast of yolks and whites. What is an angry bird to do, especially when they destroyed his house? Read channel his aggression positively by organising the building of a boat, leading the pursuit against the pigs and devising a strategy for the birds to into infiltrate the kingdom of the pigs, castle included. Apparently, a lot of fans were looking forward to catapult scenes, where Red organises a huge catapult which lands the birds in various parts of the town and into the castle. Expected conflict in’s use! This reviewer watched the film with about 55, six and seven-year-olds but was unable to discern how much the children enjoyed it or not. Perhaps they were intrigued by the antics, with older children enjoying this avian-pull sign struggle between good and evil. And, maybe the adults who are not drawn in by the plotline could enjoy the voices of Jason Siddique assess Red, with Peter Dinklage as the self-regarding former hero, Mighty Eagle, and all kinds of contributions from talent like Danny Mc Bride, Josh Gad, Maya Rudolph, Keegan- Michael Key and, they have to listen hard for it, Sean Penn. Since anger is limitless, one might presume that Red will be with us again. 1. The title, based on the video game? 2. The style of animation, the birds, the pigs? The locations, bright colours, action sequences? 3. The comic skills of the voice cast? 4. The theme of anger, Red, his outbursts, and assigned to anger management, the aim of anger, its use? His channelling it into the defence of the birds and the recovery of the eggs? 5. Red, as a character, flying, dropping the egg, coming to the party as a clown, the outburst about the cake? 6. His going to the island, his house, the anger management course, Charlie and Bomb, the exercises, the manager of the course and her approach? 7. Charlie as a person, small and agile, Bomb as a person, big and loyal? 8. The arrival of the pigs, the boat, the destruction of Red’s house, the promises to the birds, the festivities, the cover for stealing the eggs? The big hall, getting them on board the ship, sailing away? The preparations in their city, storing the eggs, preparing for a feast of eggs? The characters of the leader, the other pigs, cooks and others in the castle? 9. Character of Mighty Eagle, the statue, reputation, the three climbing the cliff, the disappointment, his silly behaviour? 10. Red, emerging as leader, the support of the group, channelling his aggression, and going to the boat, the building it, sailing, the tactic of the catapult and the variety of birds getting into the city, accidents, some success? Red himself going? 11. The film’s attention to the action sequences, outside the city, into the city, inside the castle? 12. The final heroism, and his self-sacrifice, the final egg and it being hatched? 13. Mighty Eagle, his conscience, justifying his heroism, flying, the attack on the pigs, the rescue and everyone’s admiration? 14. The final statue, Red and his place, the acclamation from all the birds, the happy restoration of all the eggs, the appreciation? The future for Charlie, Bomb and Red?